Claudia by Diana Wallis Taylor is a refreshing insightful read into a past time when Jesus spoke to the crowds. I have not read any books by Diana until now but that is definitely going to change! I loved everything about this book, and usually this time period does not interest me. The author did her research and created a beautiful look into what life was like in Rome and Judea around the same time the disciples walked with Jesus. 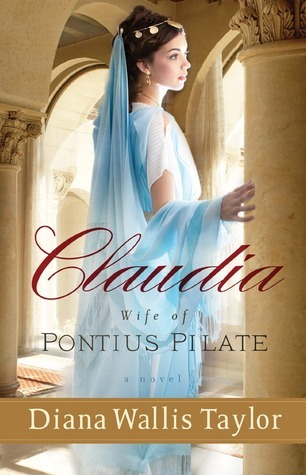 Honestly, I had never thought about Pontius Pilate's wife, she is only mentioned in a short paragraph in the Bible. While in the author's note in the book, the history is fuzzy, no one knows everything that happened to Claudia. It is believed that her grandfather was Caesar Augustus, though never knowing who her real father, she is forced into a new life that changes everything. Growing up under the emperor in Rome and then being picked as someone's wife at sixteen could not have been easy for anyone. I love the background story, Claudia's daily life, her thoughts, and the people she that surround her. She marries a man who in turn plays a pivotal part in history. The author asked, what could that have been like and wrote a great story that I could not put down. I highly recommend this book, yes there is a lot of history but the story is fantastic!